Location: Bramevaque, in the Lot departement of France (Midi-Pyrenees Region). Notes: Château des Comtes de Comminges de Bramevaque is a French château located in the municipality of Bramevaque in the Hautes-Pyrénées department in Languedoc-Roussillon, Midi-Pyrenees. It is the subject of protection as historical monuments. The castle of the Counts of Comminges is located in Barousse, at the eastern end of the Hautes-Pyrénées department, about 150 meters south of the village of Bramevaque on a promontory. If the keep still look great, the grounds and chapel are in ruins. 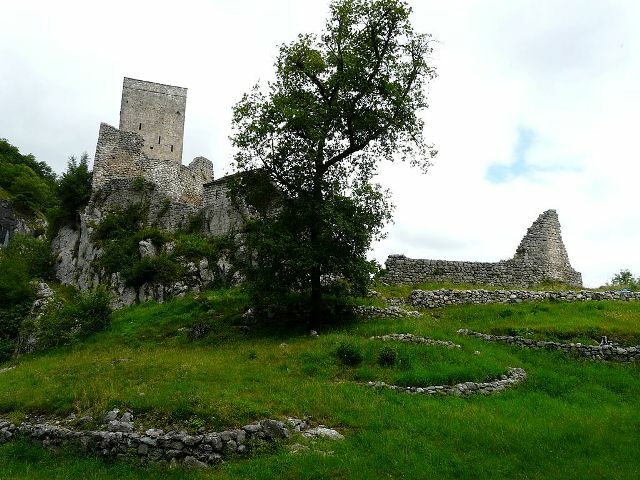 The castle was built in the twelfth and thirteenth centuries. Its ruins (dungeon, chapel and enclosure) are listed as historical monuments since December 13, 1950. Bramevaque, un château méconnu des Hautes-Pyrénées sur le site « Paratge ».